Considering how to improve tennis serve is important as having a consistent server with some power is very important for intermediate players to win tennis matches. The key here is consistency. If you have a powerful serve, but you are not able to get the ball in the service box regularly, you put yourself in a defensive position in matches. You will have to hit a lot of second serves which will probably be weak serves that your opponent can attack and take control of the point. Also, your confidence will be down as you are unable to get a lot of first serves in with power to put your self in a position to dictate the point. You arrive at the trophy pose just after tossing the ball. Your non racket hand is relatively straight and pointing upwards finishing the ball toss. The elbow of your racket hand is bent forming an L shape. The racket head is pointing upwards. The knees should be bent. Your body should be sideways to the net ie facing the side fence of the court. Look at any pro and you will see that all of them get into this trophy pose during their service motion. There is a reason for this. 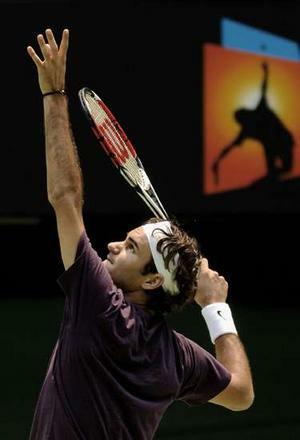 This is the best position that you can put your body to generate maximum racket head speed consistently during contact. The arching of your back and bending of your knees produces elastic power from your body. The sideways stance to the net produces rotational power from your body. The racket head is taken as far back as possible and put in a comfortable position to produce maximum acceleration and speed at impact. Look at how similar the tennis trophy pose is to the javelin throw pose. This similarity provides additional proof that through experiment we have found out that this is the best position to put your body to generate maximum speed above your head to strike or throw something. If you are an intermediate player not doing the trophy pose during your serve, incorporating this pose into your serve could be the key to how to improve tennis serve and taking it to an entirely new level. You may want to first shadow getting into the trophy pose. With just your racket in hand shadow tossing the ball and getting into the trophy pose. You do not need to complete the serving motion, just get into the trophy pose and stop. Once you are comfortable shadowing the motion, use a tennis ball so that you really do toss a ball. Shadow getting into the trophy pose as before while tossing the ball. After you are comfortable with this, you are ready to perform the entire tennis motion with a real ball, focusing on getting into the trophy pose before hitting the ball. You may take some time to get your timing right if you have not done the trophy pose before. Keep at it. Once you get your timing right, you will see more power on your serve which will come to you naturally without having to put extra effort. The serve will also be more consistent as you will have a more natural, flowing rhythm.